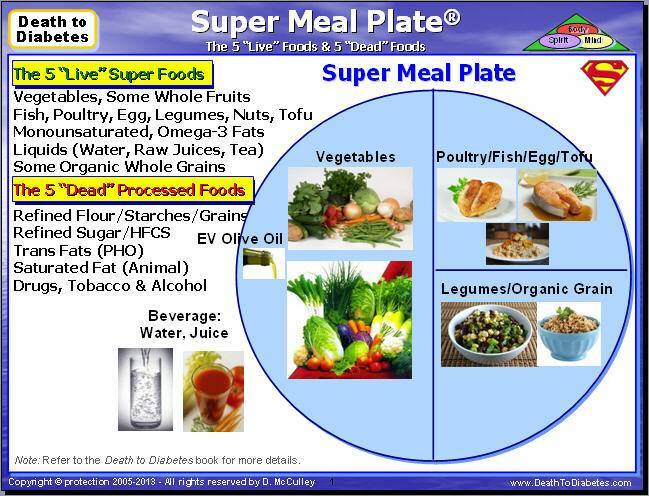 The "Death to Diabetes" Super Meal Model Plate (Diet for Diabetics) is more than "a diet". It is part of a comprehensive 10-step wellness program that is designed to improve the health of people suffering with Type 1 and Type 2 diabetes as well as other systemic health issues. This nutrient-dense meal plate model is a major improvement on the current conventional meal plates out there. This Super Meal Plate is based on a superior diet designed for diabetics (and non-diabetics), and is also designed to address other health issues such as high blood pressure, high cholesterol, heart disease, and chronic fatigue. 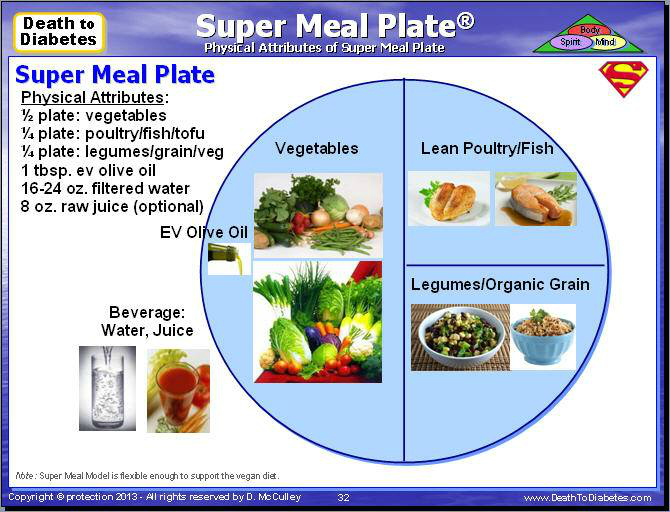 The "Death to Diabetes" Super Meal Model Plate (Diet for Diabetics) has many of the attributes of the Mediterranean Diet, Zone Diet, South Beach Diet, Asian Diet, and Vegan Diet -- with nutritional modifications to address the root causes of Type 2 diabetes and help to better control Type 1 diabetes. 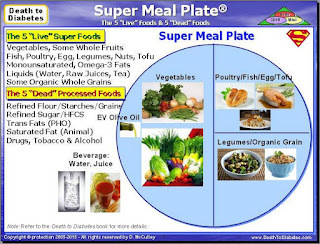 Some people see this Super Meal Model Plate & Diet (for diabetics) as a"low carb" diet, but, the author sees it as a lot more than just a "low-carb" diet. He prefers the term "balanced" diet because there is a balance of carbs, proteins, and fats that promotes cellular repair and improves the overall health and wellness of the body. Consequently, this Super Meal Model Plate & Diet can be used by non-diabetics, who want to lose weight, lower their blood pressure, or just improve their overall health. Note: The Super Meal Model Plate was designed by the author to make it easier for diabetics (and non-diabetics) to design healthy, balanced meals without having to spend a lot of time counting calories and carbohydrates. Calorie-counting ((and carb counting)) can be time-consuming and very frustrating. And, given everything that a diabetic has to deal with, the author felt it was important to keep things as simple as possible. Note: Most people just throw veggies and other foods together to create these combo-super meals, but these meals are out-of-balance and lack the proper balance of macronutrients and micronutrents. Without a proper balance of macronutrients and micronutrents, these combo-super meals do not contain the necessary nutrients to help you fight your diabetes! So, take out the guesswork and get the cookbook. The "Death to Diabetes" Super Meal Model is truly THE Diabetes Diet for Diabetics, because it is specifically designed to help control, Type 1 diabetes and to help beat and reverse Type 2 diabetes -- by providing a more sustained level of energy and key nutrients that diabetics (and non-diabetics) are missing when they consume the more traditional grain-based, overly-processed, nutrient-poor or starchy meal. The "Death to Diabetes" Super Meal Model has a very nutrient-dense protocol that provides nutrients that are key to the effectivity of THE Diabetes Diet including: carotenoids, antioxidants, Omega-3 EFAs (EPA, DHA), chlorophyll, magnesium, potassium, chromium, Vitamin E, Vitamin C, fiber, water. The "Death to Diabetes" Super Meal Model also provide key nutrients for repairing and healing the body from cellular damage due to diabetes, injury, or some other systemic health issue. This nutritional program can also be designed to accelerate the body's repair and healing mechanisms -- especially with raw juicing, green smoothies, and cleanse/detox. In addition, by avoiding the grain-based breakfast, diabetics and non-diabetics will not experience the mid-morning “crash” or craving for processed food/beverages. Over time, the "Death to Diabetes" Super Meal Model Diet for Diabetics will support blood glucose stabilization, cell repair and the regulation of the body's production and utilization of insulin.